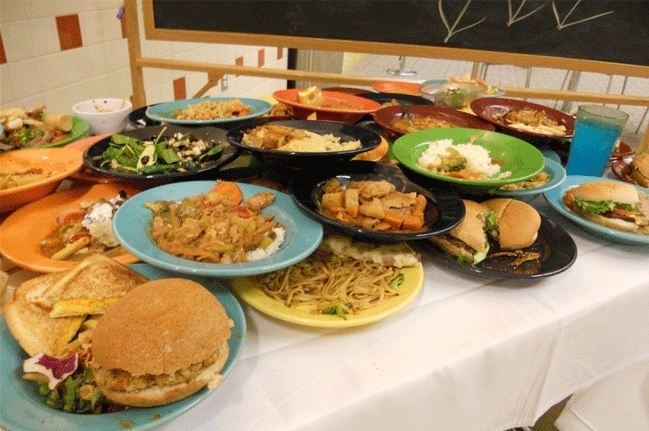 A 'waste buffet' allows students to visualize the scope of food waste. Everyone was dusty, tired and ready to relax. Pizza dinner had just ended on the third night of outdoor education in the Santa Cruz Mountains, but it wasn’t quite time to go. A counselor brought out a bucket containing all of the food leftovers from the plates of the sixth graders, their teachers, naturalists and parent chaperones. It was empty. The crowd cheered: The group had met its goal of zero waste. The camp made me think about how much food we throw away on a regular basis. Americans waste almost 27 percent of all the food produced in the United States each year. That’s the equivalent of around one pound of food a day for each American. How can we do better? At the camp, they eat when everyone is hungry, serve small portions and choose items such as pizza and salad that lend themselves to minimal leftovers. What are college campuses doing when faced with the challenge of all-you-can-eat buffets? Actually, quite a lot. The University of California has been a sustainability leader, working toward an ambitious goal of zero waste by 2020. Take for example UC Davis, home to the nation’s “Coolest School,” an award-winning eco-friendly football stadium, a student farm and robust waste reduction efforts in dining services. Trayless dining: Without trays, students only take as much food as they can grab, instead of piling on more than they can consume. Try-a-taste program: Students can sample new entrees to see if they like them, instead of getting a big portion of something they may not want to eat. Bunless dining: Staff built a tower of leftover buns from hamburgers, turkey burgers and veggie burgers, encouraging students to ask for burgers without buns. Waste audits: What’s bigger than a bun tower? The waste buffet spread on top of tables during the waste audits each fall and spring. Students are so surprised by how much waste is generated that they improve their eating habits, Lee said. Feedback from staff and students: Dining services meets regularly with staff to review menus, track portions and reduce waste. Also, it seeks student comments and consults with a board of student representatives – among the changes, offering smaller bowls for Mongolian barbecue, limiting leftovers. With UC Davis dining serving 1.8 million meals a year, these actions add up. “You’re saving quite a bit of money, energy and resources,” Lee said. For the food that is uneaten, much of it is composted: 550 tons of organic waste a year, with some turned into renewable energy at a biogas facility that uses UC Davis technology. Overall, UC Davis diverts almost 75 percent of all its waste – the UC target for this year – from the landfill. To get to the next level, UC Davis will need to improve its recycling of plastics, Lee said. UC’s efforts to increase sustainability are worth it, said Lee, who began advocating for waste reduction as a UC Davis student, coordinating with campus cafes to compost their coffee grounds. It’s a reminder to think about what you need the next time you dine or shop for groceries. Watch not only what you eat but how much you eat. Be judicious. Serve appropriate portions. Waste not, want not. 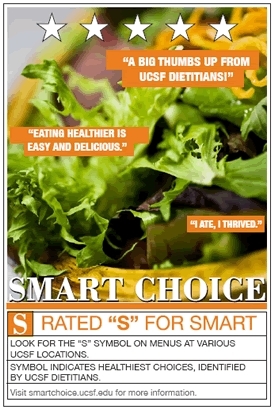 Smart Choice is a wellness awareness program at the developed by UCSF Medical Center Department of Nutrition & Food Services. Can I introduce the unappetizing topic of hospital food? Hospitals are notorious for not practicing what they preach in their own food service operations. Their food vendors provided fruits and vegetables that were overcooked, over-sugared, over-salted and ready-to-eat. By “leaving the cooking to them,” vendors made cafeterias more profitable by eliminating labor-intensive, freshly prepared meals. Kitchens replaced skilled cooks with untrained staff who rarely needed paring knives except for opening, reheating and disposing of packaging. Fortunately, sustainability goals are helping hospitals (like school cafeterias) undergo menu reform to make more local, fresh options available for their staff, visitors and patients. Kaiser Permanente, a leader in the reform movement since 2003, has established 50 farmers’ markets at their facilities. A recent survey published in Journal of Agriculture, Food Systems, and Community Development (subscription required) found that 74 percent of patrons surveyed at Kaiser Permanente markets consume more fruits and vegetables as a result of shopping there, and 71 percent indicated that they were eating a greater variety of fruits and vegetables. Gail Lee, UCSF’s Sustainability Manager, credits UC Office of the President for inspiring each campus and medical center food service operation to achieve their goal of procuring 20 percent sustainable food products by the year 2020. UCSF started weekly farmers’ markets at the Mission Bay campus from April to November and at the Parnassus campus year round. UCSF is working towards achieving zero food waste by 2020, having implemented post customer compost/recycling programs at 100 percent of their food service locations last year. Composting will help UC campuses achieve their goals for zero waste. Procurement practices — yogurts served to patient and visitors are now local and organic — play a major role in transforming menus. As project manager for an EPA-funded project award, Gail is partnering with UC Berkeley to identify systematic methods that will encourage certifiable, green procurement. She launched their green office and green lab certification and produced an entertaining sustainability video that created a buzz at all four SF campuses. I am proud to be joining Gail’s team to help implement the UC goals. UC Davis was recently declared a “cool school,” but UCSF is well on the way to becoming a nationally recognized “cool hospital” and research campus. This is good news for those of us who prefer fresh fruit salad to canned fruit cocktail, in spite of the fact that fruit cocktail was a UC Berkeley invention. Professor William Cruess was looking for a way to use the small, wasted bits left over after canning fruit. In his defense, I have to remind myself that the alternative for many parts of the nation in that decade was no fruit at all. He saw fruit spoil in the orchards because what was true then is still true today — California produces much more fruit than locals can possibly eat. Let’s not forget to eat our share of the local bounty. As the local food movement scales up and consumers demand information about where their food comes from, more grocers and institutions are seeking wholesale access to local produce. 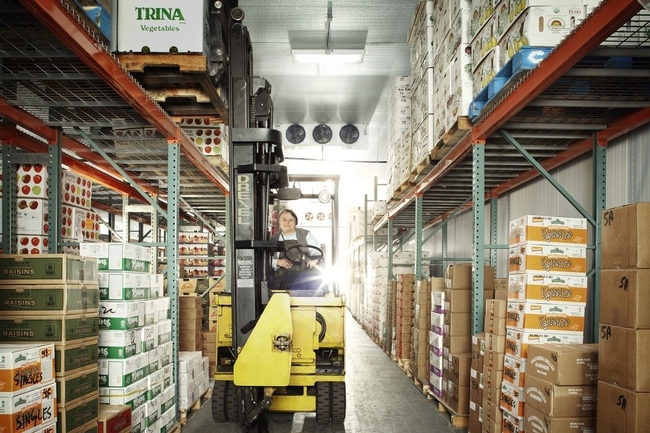 To make the connection between producers and retail sellers, distribution networks are taking on an increasingly important role in the local food system. More and more, farmers are becoming part of values-based supply chains and ‘food hubs’ to pool their product with that of other farmers and move food more easily to market and complete the chain from farm to fork (*). New reports released by the UC Sustainable Agriculture Research and Education Program (SAREP) show that, while food hubs help close the gap in distribution efforts, farmers should invest carefully. UC SAREP has created a Farmer Toolkit for those interested in taking part in a food hub. “We wanted to suggest some questions farmers should consider before getting involved with an enterprise,” said Gail Feenstra, academic coordinator at UC SAREP (*). “When food hubs are working,” Feenstra said, “the farmer gets a higher price for their product, and everybody along the supply chain benefits. Consumers get the satisfaction of knowing where their food comes from, and the food is good quality” (*). But the challenges of food hubs are steep. While food hubs often succeed at keeping the social and environmental values of their products front and center (that they are organic, local, or grown by family farmers, to name a few values), business plans for long-term success are not always part of the planning process (*). For farmers looking to keep their social and environmental values embedded in their products, abandoning traditional distribution networks may not be the way to succeed. Rather, “creative partnerships between conventional players and more alternative folks may be a better model. In cases where you can create cooperative of growers in which they own the process and they’ve got good management, it’s a slow build up, it can’t happen overnight. But they can succeed,” Feenstra said. The farmer toolkit is meant to give farmers a better sense of how to make that success happen and how to bring the value of sustainably produced food into the supply chain. The farmer toolkit and more information on values-based supply chains can be found at the UC SAREP Web site. 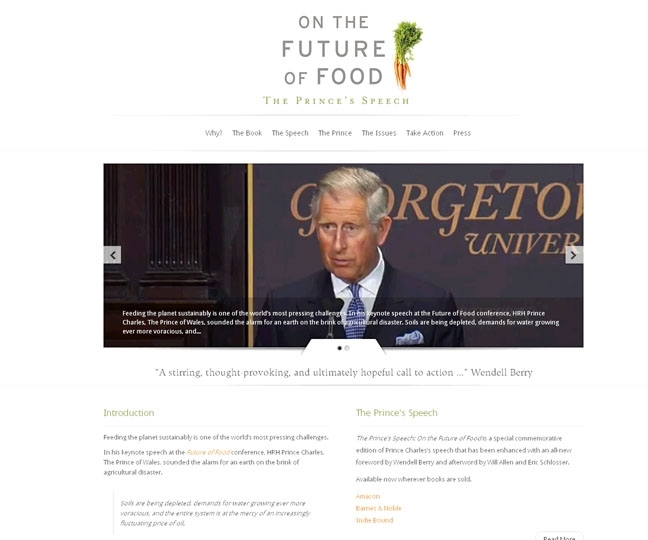 I was recently given a copy of the Prince of Wales’ speech “On the Future of Food,” offered at a conference of the same name, held at Georgetown University in Washington, D.C. in May 2011. Rodale has reproduced the speech in a small pamphlet with a foreword written by Wendell Berry, and an afterword provided by Will Allen and Eric Schlosser (all super writers and superstars in the sustainable food system movement). 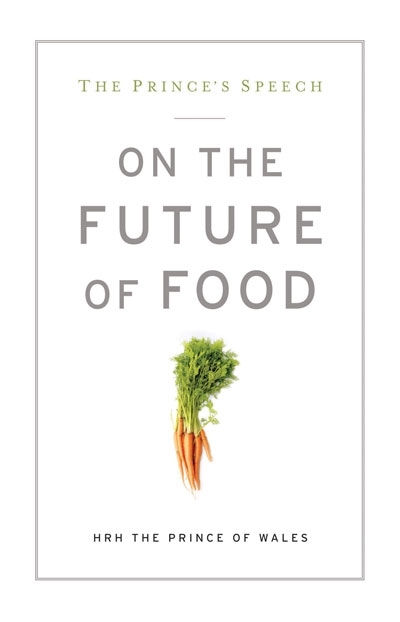 GRACE Communications, which helped sponsor last year’s conference, has created a website – www.ontheFutureofFood.org – to serve as a central site where individuals can learn more about the topic and this speech. The pamphlet or tract format of this publication was intriguing to me; I immediately thought of Thomas Paine’s Common Sense. It evoked a sense of the historical use of pamphlets in America as a means to influence political life. Its compact size and compelling message invite the reader to pass it on. (I did find it all a little dizzying in a historical sense to think of the food aspect of the relationship between America and Great Britain over the centuries: America first as a British colony with a role in providing agricultural and natural resource products to the mother ship; then America as a new nation created by a revolution of farmers – okay, farmers AND others; America providing much needed sustenance to England during World War I; and in 2011, a modern American audience hearing an important message about sustainability in food systems from a member of the British royal family. Admittedly, though, there is an enormous difference between King George III and Prince Charles). The food system today is a highly political issue. Nearly everyone I know agrees that the future of food will require a complex and inter-related set of choices and actions, each with economic, cultural and geopolitical implications. Nearly everyone I know agrees that many of our current practices are not sustainable when considered within any number of frames (water quantity and quality, pollution, soil erosion, climate change, social justice, etc). We can no longer afford to view pieces of the food system in isolation (whether by commodity or a single geographic location). Rather, we must view the system as a whole, because the “solution” to a production problem in a certain commodity or place may create problems in other areas. Acting in concert may save us; continuing to consider food production in an isolated fashion will certainly doom some of us. Prince Charles notes that food insecurity threatens political stability in some countries. Prince Charles discusses in some detail international food insecurity, which is a very serious issue with implications for all of us. Agricultural productivity is declining, population is increasing, and the challenges on the production side are complex and growing. His Royal Highness notes that food insecurity threatens political stability in some countries. We’ve seen that in the last year in the Middle East: social unrest is about a desire for democracy, but it’s also about the cost of bread. In countries where economies are growing (such as India and China), diets are becoming more westernized (i.e., increased consumption of meat), which places additional demands on a system operating under finite resources and other constraints. In 2008, a report called the “International Assessment of Agricultural Knowledge, Science and Technology for Development” was published. Representing collaboration among a number of groups, including the United Nations, the report concluded (among other things) that small-scale farming systems utilizing agro-ecological approaches were found to be among the most productive in what the report classified as developing nations. This finding could have implications for how the challenge of food insecurity is approached. A full copy of the report can be found at www.agassessment.org; it provides an interesting and somewhat sobering view of the state of agriculture and food systems around the world. In general, “On the Future of Food” lays out most of what more and more people are coming to believe about the food system. It does so succinctly, summarizing a wide range of issues briefly (yet thoroughly). It provides a systems view. What is novel in the piece are Prince Charles’ statements about the true costs of food production, which he argues are not factored into the bottom line. His point? Everyone pays a higher price than the “market price,” whether it be through the costs of mitigating pollution, increased public health costs due to higher obesity rates, etc. Of no small consideration are what Prince Charles terms the “true costs to the Earth” of certain production practices. (He deems low food prices in some nations “an illusion”). He also briefly discusses a study, sponsored in part by the United Nations, entitled “The Economics of Ecosystems and Biodiversity” (TEEB), which explores the concept of natural capital. The purpose of this study in part was to “initiate the process of analyzing the global economic benefit of biological diversity, the costs of the loss of biodiversity and the failure to take protective measures versus the costs of effective conservation.” The full report can be found at www.teebweb.org. Some have dismissed the prince’s work on sustainability issues as the dabbling of a rich royal who is removed from the concerns of real life. However, through his foundation, the prince has been engaged in the issue of sustainable communities for a quarter of a century. He has long been engaged in developing sustainable practices on the properties he owns. Since 2004, Prince Charles has also worked on an “Accounting for Sustainability Project” that provides tools for various businesses and other groups to help achieve the changes needed in corporate reporting, accounting and decision-making that will take into account natural capital (the kinds of changes he deems necessary in the food system for it to achieve true sustainability). The Prince of Wales shares how he is inspired by recent initiatives in the United States (he even mentions Wal-Mart’s local/organic sourcing). Perhaps the most emotional and emphatic arguments for change in this pamphlet come in the foreword and afterword, written by Wendell Berry, Will Allen and Eric Schlosser (the afterword having a particularly populist feel to it). The prince uses a number of statistics in this pamphlet, and the references page might prove particularly useful to those seeking current information on the topic. This was a good quick read that I’m eager to pass on. The novel size and format attracted the interest of my teen daughter as she passed by; she wanted to know what it was and it sparked a conversation that was worth having…on the future of food. Agricultural innovation and technological advances have been harvested from UC Davis over the last century. As advances are achieved, our growing global population applies pressure for researchers to achieve more. California is a top world-wide producer of agricultural products, and California researchers work hard to find new and better ways to produce food. The UC Davis College of Agricultural and Environmental Sciences (CA&ES) does much to contribute towards this effort. The recent CA&ES Outlook: Feeding a Hungry Planet highlights current research and innovations to provide agricultural producers knowledge and technology needed to make better, faster and economically sound decisions. This work is focused towards agriculture, conservation and economics. The articles are interesting and provide much food for thought. Everyone needs to eat, and our global population is growing quickly. Economists have documented substantial long-term benefits of agricultural research. To continue feeding a growing population we have two options: increase yields on land already in production, or expand agriculture onto new land. UC researchers are developing “precision agriculture” methods, which use global positioning systems (GPS), geographic information systems (GIS), wireless networks, and innovative sensor technology to deliver precise amounts of water, fertilizer and pesticides to individual plants or small blocks of plants. This individualized management will save growers money and reduce the potential environmental load from excess fertilizer and pesticide use. Using GPS, a mechanical weeder has been developed. This will save growers money and reduce the need for herbicide use. On-campus testing has been successful and the weeder will be tested in a commercial field next year. Increasing biodiversity on and near the farm provides many benefits towards increased food production while increasing the sustainability of farming systems. Learn more about these topics and many others in the Fall/Winter edition of CA&ES Outlook. To find out more about the UC Davis College of Agricultural and Environmental Sciences, or to view previous publications please visit their website. 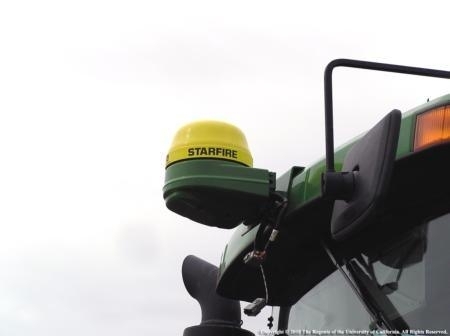 GPS receiver mounted on a tractor cab. GPS systems are increasingly used in agriculture. Photo J. Williams.